"If you won't let me have access, I'll go to Feathers for Justice!" "When do we tell him that he's adopted?" I don't Know what Daisy is going to think when she sees this! "Your father? Well, he was a sailor, tall, cuddly and handsome and was lost at sea, why?" "That bloody Long Lost Families TV show has a hell of a lot to answer for. Now piss off you money seeking plebs!" *whisper* "The Drake is often larger and more brightly coloured than the hen." When you have kids...and he still acting like a cartoon. Donald’s and Baby’s Day Out! No its Micky that's married to Minnie. They knew they would be famous because they had a big duck following. I took the family to Disneyland and was left with a massive bill. "This is what Gulliver must feel like"
"Donald, you're an embarrassment. If you must dress like a clown you'll have to walk behind us." "All I'm saying, Pet, is that none of them look anything like me." Ignore him .... he’s fowl mouthed, it disney bother me. The confusing world of Disneyland North Korea. For Donald, being a father was like a walk in the park. "Watch you don't step on the quacks." When it came to his nephews, Donald was Dewey-eyed. "The guy behind seems strangely animated"
"No kids, I don't know what that noise was...it sounded like someone repeatedly trying to say the word 'anonymous'"
I've already sold them, so no parental rights for you. As American suitors go, he’s not the worst Donald she could have gotten. 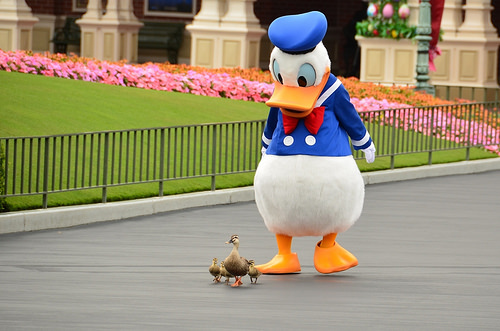 Donald doesn't duck out of his parental responsibilities now he's a Dad.